With July here Josephine was not going to daycare a few times a week for short days. The initial drop offs, predictably, were not smash hits with her. She calmed quickly as we left but seemed unimpressed with her peers. After all, she is used to mixing it up with three and four-year-olds. What was up with this group of children the same size as her? Nonetheless, she attended school bravely and allowed her mother to have a whopping four hours to get her work done. This was still nowhere near the amount of time she actually required but a vast improvement over no time at all, short naps, or most commonly after everyone is asleep. Before my parents left we were able to enjoy a few late night pokewalks. 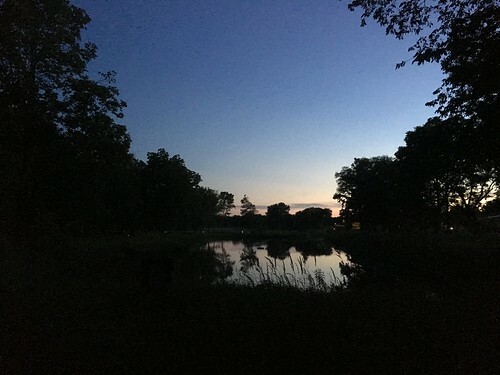 We went on a wonderful late night stroll through a nearby park and enjoyed a nice sunset in between catching imaginary creatures with our cell phones. Seeing the joy on my childrens' faces as they play in their newly constructed playset still does not make it worth the hassel of putting it together. If they didn't love it as much as they do I'm pretty sure I would resent them for the rest of their lives. The zucchini harvest has been unbearably large, as normal. We've enjoyed (or at least tolerated) zucchini at every meal. One dish was this zucchini carbonara that turned out pretty great. Josephine has enjoyed Nana's rocking chair. Mostly she's enjoyed standing in it and getting a reaction from her parents. Martin has been obsessed with sculpting things out of Play-Doh. One creation was this Pikachu. 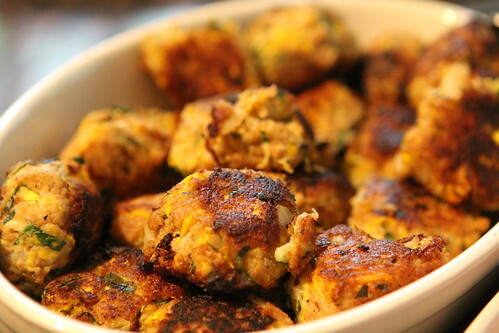 Jen made zucchini cakes with yogurt sauce one night while I was at work. The children enjoyed them enough so that there were none waiting for me when I got home, a stark departure from most zucchini-based dinners we've made lately. 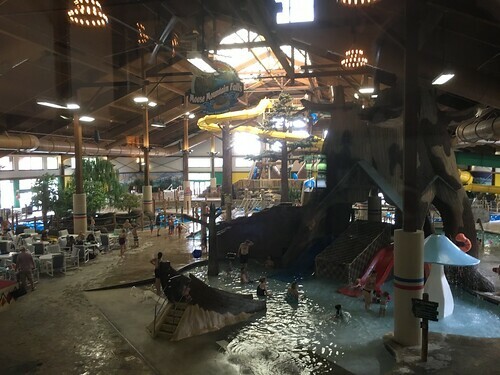 We surprised the kids with an overnight trip to an indoor/outdoor waterpark which was a huge hit. Thankfully they had a blast inside, outside, and at the arcade. It was a ton of fun. The boys are pretty good in the water now but supervising Josephine to make sure she doesn't drown is a fulltime, extremely stressful job. The boys checked out some books from the library. Elliott picked this seemingly harmless book featuring two children on it dressed like superheroes. We thought nothing of him reading it all the time. One night while I was cleaning up I flipped through the book and discovered it was a graphic novel intended for teens or adults. I learned this by flipping to a part where one of the characters puts on a gas mask and kills his own mother. Note: pay better attention to what they're checking out of the library. The only vegetable just as plentiful as the zucchini has been the tomato crop. 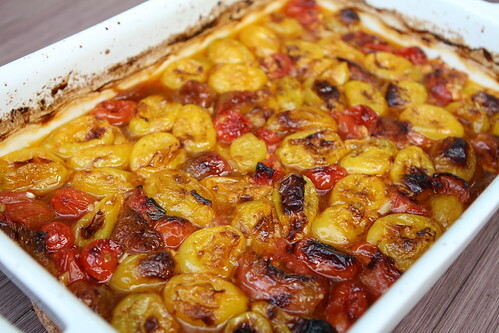 Tomatoes are a little easier to use and Jen made a delicious tomato sauce by roasting them in the oven. 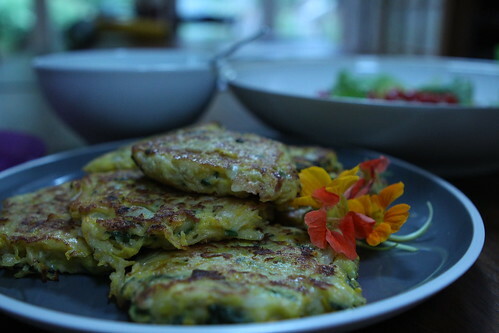 Jen also made zucchini fritters which we served with a summer vegetable boil with ham to use up most of what we were backing up on. Elliott has enjoyed Martin's gift perhaps more than Martin and has been regularly shaving in the tub although sometimes he leaves the shaving cream out and Josephine eats it. Jen was away for a business trip so I took the boys on a bike ride at the park. Martin, who I realize had never really encountered a hill, took off down a steep hill, and went through an underpass as I chased after him. While I ran toward the tunnel he was approaching I had visions of broken limbs but I came to find him startled, but perfectly balanced on his bike having steered clear of any danger. For the rest of the ride he took all hills extremely gingerly. We also went to the Arboretum. I took this photo of the boys before looking around twenty seconds later to find Elliott was missing. It was a long five minutes before I finally found him. My knees are still a little weak just thinking about it. Luckily the Arboretum serves beer and I had, perhaps for only the second time in my life, a beer before 12:00 PM. When Jen returned we took the kids to the beach where they both requested to be buried and they wore themselves down leaping into the pool at least one hundred times. After swim class and the beach I let them watch a movie on the iPad to wind down. It was perhaps the smoothest bedtime in ages. More zucchini. Grilled with basil balsamic marinade and feta cheese. We also went to the zoo and I got to see the primate house for the first time which was pretty impressive. Josephine was mesmerized by the monkeys leaping around. Josie learned a new word, "Cook!" She chants it regularly every night after dinner until I give her a cookie. She then wanders around eating it and leaving surprisingly few crumbs throughout the house. The boys got medals for soccer. They were already obsessed with medals from pretty much every book and story ever. They think a mayor's main responsibility is handing out medals. That's silly because everyone knows a mayor's main responsibility is cutting ribbons with comically large scissors. As the summer draws to a close at school they made some nice notes for their teachers and gave them to them at their last day before Pre-K.
Another milestone was their first cousins sleepover. The nighttime chaos was no greater than normal and, surprisingly, they all went to bed with fairly little incident. We took our second annual trip to the Renaissance Faire. What a difference a year makes. The fact that it was twenty degrees cooler probably also had something to do with it. We got the jousting in time this year and they were so excited. Every night since then they have grabbed anything they can to make knight costumes and lances. They say to do calming things for your children before bed. What could be more calming than a few rounds of jousting? Martin has continue his sculpting by making Ninja Turtles and showing them to me. He also sometimes sneaks up and leaves them right on the side of my bed and, unfortunately, I roll over onto them. Josie's first days of day care are still a bit of a mixed bag of emotions. Mixed in that her brothers love it and she hates it. She does warm up to it fairly quickly but she now is able to determine earlier and earlier that we are taking her. She does not take kindly to this daily betrayal. Last night we did "Family Band" which is a common activity before bed where the boys stand on their beds and sing along to Dire Straits songs. First, Elliott arranges the audience on the floor and has us sit down. Second, they turn off the lights and sing into their sippy cups while jumping on their beds. Josie got into the action by dancing for the entirety of their show and screaming when it was time for her to stop. Our summer activity list is nearly complete. I feel we've probably made more progress on it this year than in nearly any other year in the past. Certainly better than before we had kids. It doesn't come without a cost and that cost is in pretty much all of our bodies hurting all of the time and in it taking ten minutes to get out of bed in the morning. I really thought that was going to start up a lot later than this.